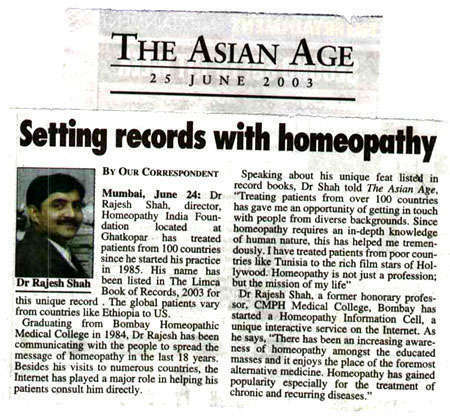 Graduating from Bombay Homeopathic Medical College in 1984, Dr Rajesh has been communicating with the people to spread the message of homeopathy in the last 18 years. Besides his visits to numerous countries, the Internet has played a major role in helping his patients consult him directly. Speaking about his unique feat listed in record books, Dr Shah told The Asian Age, "Treating patients from over 100 countries has gave me an opportunity of getting in touch with people from diverse backgrounds. Since homeopathy requires an in depth knowledge of human nature, this has helped me tremendously. I have treated patients from poor countries like Tunisia to the rich film stars of Hollywood. Homeopathy is not just a profession; but the mission in my life". Dr Rajesh Shah, a former honorary professor, CMPH Medical College, Bombay has started a Homeopathyt information Cell, a unique interactive service on the internet. As he says, "There has been an increasing awareness of homeopathy amongst the educated masses and it enjoys the place of the formeost alternative medicine. Homeopathy has gained popularity especially for the treatment of chronic and recurring diseases."